I got up after an amazingly restful night (seven full hours of sleep!) and got dressed. I had laid out everything I needed over the several days before, so there was no last minute worry. It is recommended that you wear “disposable” clothing over your running gear to stay warm, so I left the apartment in an old pair of sweats, carrying my clear plastic “baggage” with a hoodie and my breakfast inside. I got on the train headed for South Ferry station. Over the course of a dozen stops, eight more people boarded wearing D tags on their shoes and carrying their plastic bags. I had my Luna bar and a bottle of Gatorade on the train. Arrived at South Ferry and left the subway to get on the Staten Island Ferry. Talk about a madhouse! Several thousand runners were standing, sitting, and laying around. I discovered that an earlier ferry hadn’t appeared at the appointed time, so there were people there that should have already left. Because I got stuck in a ginormous clump of people and had no choice but to move forward, I ended up on the 7:45 ferry, which was earlier than the one I was actually assigned to. Arrived on Staten Island and began the mile-ish walk to the shuttle buses. This is when it became apparent how cold it was outside, particularly with the wind coming directly off the water. I wished I had brought gloves. Arrived at Ft. Wadsworth, the staging area for the marathon. I was assigned to green wave three, so I walked another mile or so to the green athletes village to wait two hours until I was scheduled to start running. I visited a porta-pottie, had half a bagel with salt, had some water, turned my baggage over to the UPS workers, then watched the beginning of the race on the giant screen that was in our village. While watching the race, I spoke to a woman who was 80ish. 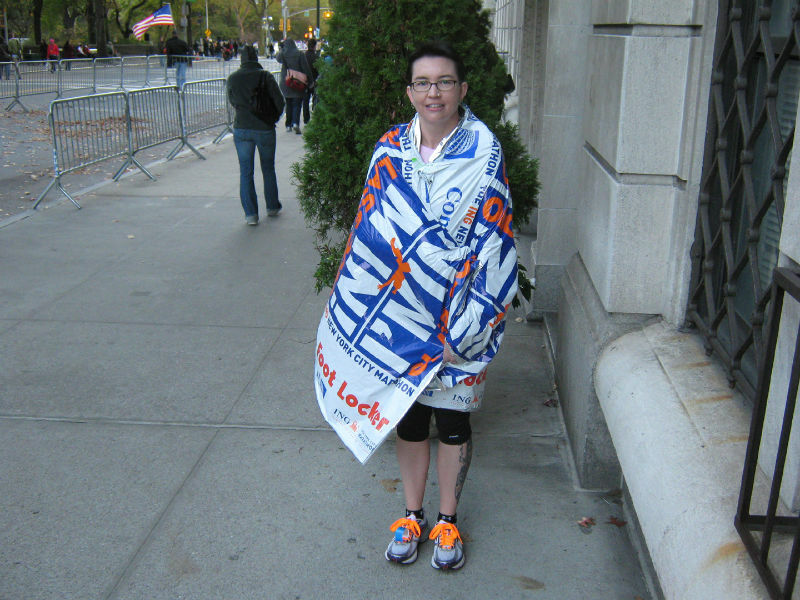 She was running not only her first marathon, but her first race ever! Every runner has a story. The corrals for my wave opened, so we all walked toward the fenced off area at the on ramp to the Verrazano Bridge. That was where we were told to discard our disposable clothing so that it could be picked up and donated to local homeless shelters. We all took off our warm gear and stood in the cold. And believe me, it was COLD. The corrals were opened and we were released to the starting line on the bridge. There are three colors per wave: blue, orange, and green. The blue and orange runners run on the top level of the bridge; the green runners are on the lower level. I was headed to the lower level. After singing the national anthem and a short speech by someone, the cannon went off and it was finally time to run! The Verrazano was BRUTAL. Since I was on the lower level, it was shaded and with the high winds…wind chills were probably hovering right at freezing. My teeth chattered the first half mile at least. Oddly, the bridge went by really fast and didn’t feel steep at all. The mile one marker is halfway across and then next thing I knew, we were in Brooklyn in the delicious sunshine! That was where the runners still wearing warm gear started shedding. (There were really nice discarded pieces of running gear along the entire course. I was so tempted to pick things up!) But that was also where we started experiencing cheering crowds. This was a favorite part of the race. I felt good and it’s my home turf. I run through these neighborhoods all the time, so there was familiar terrain and familiar faces. Also, these neighborhoods have the most children, so there were lots of little ones lining the route wanting to give high fives. And my sweet husband was right at mile 4 waiting to give me a kiss. There were a bunch of guys yelling “Where’s my kiss?” but I did not kiss any of them. Still cruising along through fabulous Brooklyn. This is where I saw co-workers Vanessa and Donna. This was also the stretch that had some of the best fans. There were lots of marathon watch parties, with people in costumes, giant bunches of balloons, posters and banners hanging off buildings, and lots of good bands. It was a little more subdued in Williamsburg, the home of many Hasidic Jews (who, frankly, didn’t look all that enthused to have us running through), but there were also some enthusiastic hipsters hanging around and some good bands in this stretch as well. I saw another co-worker, Patty, in Greenpoint, just before we hit the Pulaski Bridge into Queens. At the halfway point I realized I had smashed by half marathon race record by 13 minutes! That felt like an accomplisment in itself. This was a weird stretch in one regard, though. I decided not to run with a pace group, but thought if I saw one along the course that I thought I could keep up with, I might run along with them. Well, somewhere in Williamsburg, I was passed by the 4:50 pace leaders–and they were going quite fast. I was all “Man! I’m getting passed up by the 4:50 group!” But when I looked at my Garmin at the next mile marker, it appeared I was going a lot faster than that. So I was confused. About 20 minutes later, I was passed by the 4:30 pace leaders! That made more sense, because at the half point, I was exactly on track to hit 4:40, but it still makes no sense for the 4:50 pace leaders to be that far ahead. 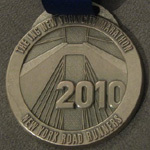 I think the Pulaski Bridge was the hardest of the race. Most people say the Queensborough (59th St.) Bridge is the worst, but I thought Pulaski was terrible. Halfway across the bridge was a group of bagpipers, which was really really cool and they helped get me over the hump. On the other end was a man with a bullhorn yelling “Welcome to Queens.” That made getting off the bridge that much sweeter. In Queens it felt like we were turning and turning and turning, but finally we were at the Queensborough Bridge. (Mike and Tommy Tom Tom were there and yelling at me, but I didn’t see them.) This is considered a pinnacle point in the marathon and this was where I started having trouble with my hip. I stopped halfway across to re-tie my shoe and I did a little stretching, but it didn’t help. Right at the bottom on the other side I started having shooting pains. Needless to say, this was a painful part of the race for me. As you come off the bridge, you make a left onto 1st Avenue. Everyone always talks about the “wall of sound” that hits you at this point in the race, but I personally thought Brooklyn was more enthusiastic. In the 80s, there were A LOT of bars having watch parties, so there were people 10 and 12 deep and quite boisterous, but I was in too much pain to enjoy it. Thankfully, my hip settled into a dull ache by the time we got to the Willis Avenue Bridge. Not much time is spent in this borough, but I found the people there to be particularly insistent that I keep going. lol The fans there were quite loud and it felt like every single runner was singled out for cheering purposes. I felt pretty good and as I crossed the 20-mile mark and moved into uncharted running territory, I started being less concerned about hitting the wall and more confident about finishing. Except for the sun in my eyes, Harlem was one of my favorite parts of the race. There were amazing spectators here and really good music. However, it was the transition from Harlem to 5th Ave. that was also the transition from Norma feeling pretty good to Norma feeling pretty bad. As we came down 5th Ave., the crowds were all out in the street, so we had about eight feet to run in, which sucked. There were a lot of people walking by this point, so it was all about dodging other runners, which caused the hip to act up again. I had to walk myself for about two blocks and then stop and attempt to stretch again. Both my hips were tight and my hamstrings were on FIRE. But I managed to make it into the park and I skipped the last water station in an effort to get to the finish as quickly as possible. (This was where I tore my name off my shirt because I was tired of hearing it. lol) Amazingly enough, as soon as I hit mile 25 I had a second or third or fourth wind and literally flew down Central Park South. I felt like a million bucks and it was my fastest mile of the whole race! I felt like I could run forever, but luckily I didn’t have to. Turned at Columbus circle and the finish line was just .4 of a mile ahead. It felt so good to run through the arches and high five the volunteers there! Well, they say if it was easy, everyone would do it. But when you’re one of 44,000+ runners, it does sometimes seem everyone actually is doing it. 🙂 Seriously, you will never feel closer to being a rock star as you will running NYC. 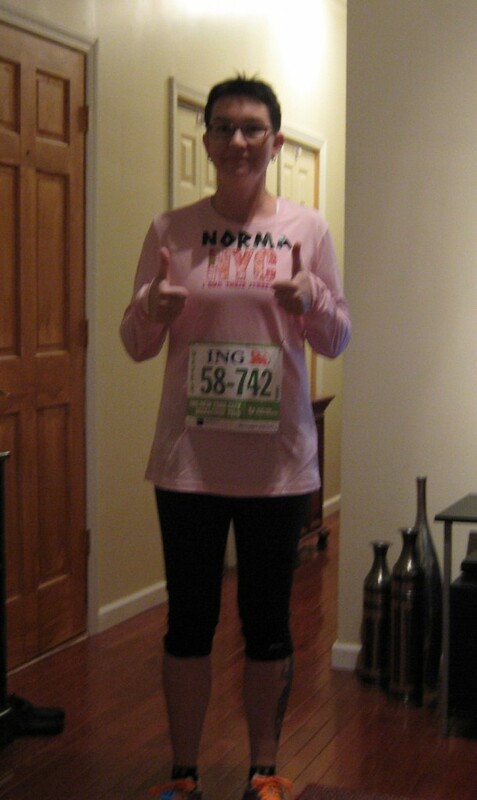 Since my name was on my shirt, I heard “NORMA” shouted from all directions all the time. The crowd support overall is amazing and proves once again that New Yorkers are some of the best people in the world. It also proves that our city loves to PARTY. lol I especially appreciate the people along the course handing out paper towels and tissues. Also, thanks to the woman on 1st Ave. who had the oranges. That was a big pick-me-up after getting used to eating apples on my long runs. Item most missed: lip balm! I found the first half really easy, truth be told. 13.1 miles is a fun distance for me now and I’m looking forward to running a couple of halfs next year. 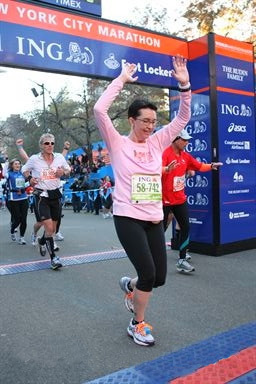 I’m planning on running at least one more marathon next year and I’m hoping to run NYC again–I’m already in the lottery! But if I don’t get in next time, I’ll be out on the course again, cheering everyone else. Because that’s fun, too!! !